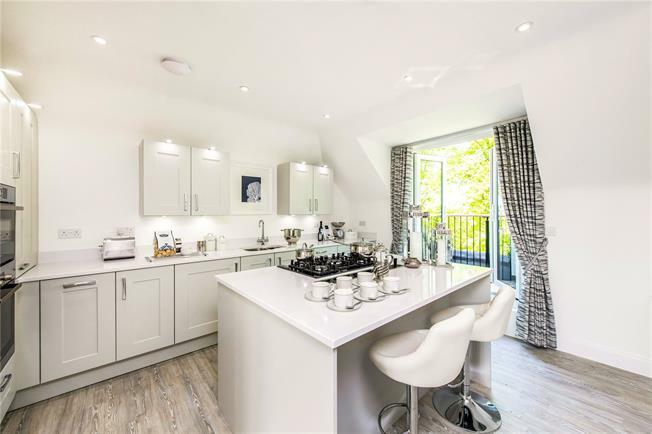 2 Bedroom Flat For Sale in St Albans, Hertfordshire for Asking Price £875,000. A 2-Bed/2-Bath Second Floor Penthouse apartment is part of Maryland Place, by Beechcroft Developments. The site has a collection of 35 newly-built houses and apartments designed exclusively for the over 55s. The Apartment boasts Drawing Room, Dressing Room to Bedroom 1, wardrobes to Bedroom 1 and 3 Balconies. Show Home to include curtains, blinds and light fittings. and the upkeep of both private and communal gardens. including a single oven, a five burner gas hob, combination microwave/oven, fully integrated dishwasher and fridge/freezer and a washing machine and tumble dryer in utility area. Stainless steel sink and mixer tap. Choice of Amtico flooring to Kitchen ( Subject to stage of construction). and En-suites ( Subject to stage of construction). Choice of Amtico flooring to Bathrooms and En-suites ( Subject to stage of construction). Mirrors fitted in Bathrooms, En-suites. - Heating is via a gas fired underfloor heating system. Pressurised hot water system. Stone fire surround with a chrome Opti-Myst electric fire. Double glazed UPVC windows. - Fitted wardrobes to Master Bedroom and Bedroom 2.
exception of Kitchen, Bathroom and rooms with sloping ceilings. Moulded skirtings and architraves. applicable ( Subject to stage of construction). - Low energy fitment pendant lights. LED downlights to Kitchen, Bathrooms/En-suites and Dining Halls where applicable. Telephone points to the Drawing room and Bedrooms. Communal satellite dish and TV/radio systems compatible for Sky+ system and Sky HD. - Video door entry system. Window locks to all windows. Security alarm fitted with panic buttons in the Master Bedroom and by the front door. Mains operated smoke detectors with battery backup and mains powered Carbon Monoxide detector. - 10 year CRL warranty issued on build completion. - Show Home to include curtains, blinds and light fittings. ‘on your doorstep’ and, with great commuting links, you can be in London in just 20 minutes by rail. and art gallery soon to open within the Georgian Town Hall. St Albans is well connected with regular rail services to central London taking approximately 20 minutes and there’s an Abbey Flyer train into Watford that connects with the London Euston service. Luton Airport is just two stops on the St Albans to London railway line. By road, there is easy access to the A1(M), the M1 and the M25.